The Banggai Rescue Project was founded in 2012 as an international, multidisciplinary effort to work toward a healthy future for the Banggai Cardinalfish, Pterapogon kauderni. Endemic to the Banggai Islands of Indonesia, this unique species has an Endangered designation on the International Union for the Conservation of Nature Red List. 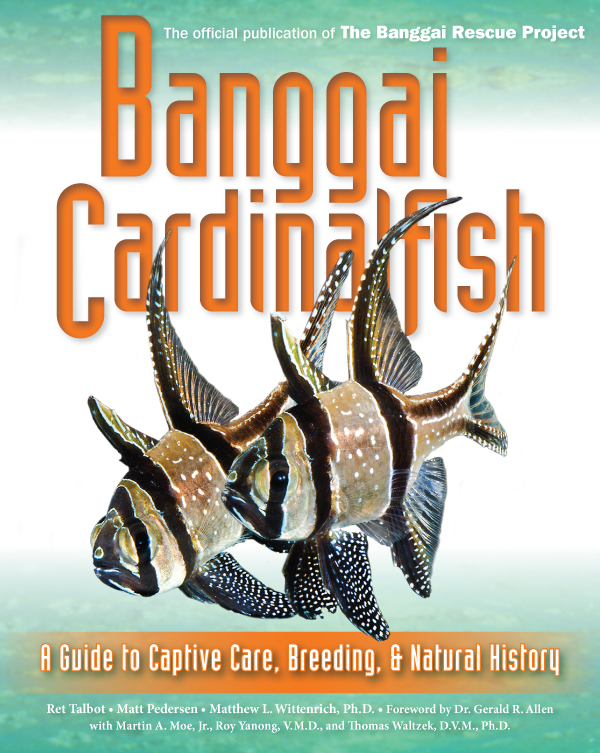 Official Publication of the Banggai Rescue Project, available first at MACNA 2013. Click for larger image. UPDATE: Banggai Rescue Project Official Book is now available in softcover, and eBook editions (hardcover has sold out). Order now. Lead organizers include CORAL Magazine and Reef to Rainforest Media, LLC, with scientific leadership from the University of Florida’s Tropical Aquaculture Laboratory and partnership with the Indonesian Nature Foundation, Yayasan LINI. Goals of the project are to protect the species in its natural habitat, to encourage the implementation of sustainable fishery management, and to take pressure off wild stocks by fostering the development of captive breeding programs.